Ladies and gentlemen. 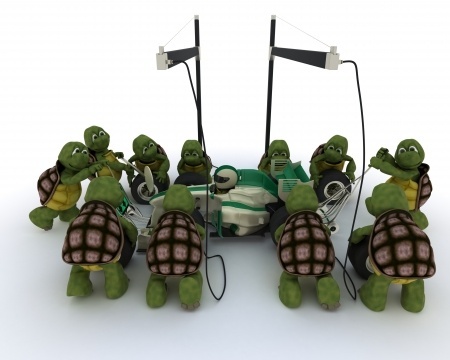 Get off your writing rumpuses and line up your turtles! Have you rotated your tires? Changed the windshield wipers, oil, and brake pads? Topped off the fluids? Cause you can’t waste time twiddling your thumbs once you’re out of the starting gate on November 1. Currently, there are over 125,000 authors signed up for this year’s novel writing extravaganza. I’m one of them. Only 1,667 words a day. I can do it. So can you! Join a local NaNoWriMo group if you need some support or go online to a NaNoWriMo forum. Visit NaNoWriMo for more details. Good luck – just off to see if I can get a memory upgrade for my Kindle! Yes, it’s enough to send one over the edge, isn’t it? Never mind memory upgrades for Kindles, what about memory upgrades for ME! I’m having myself cloned – I reckon 20,000 copies of me should be just about enough – though where they’ll all sleep, I just don’t know! You can use the books to build walls for new rooms. They can sleep there. Just imagine yourselves as a small,dusty city. Go, Jill! You may need to borrow that darkened room when November is over, but what a fabulous endeavor and writers bonding event NaNoWriMo has become. I remember when it took off and I could barely spell it. Have fun! Thanks, Laurel! I may be a mere shadow of my writer’s shadow by the end of November. We’ll see. LOL, does NaNoWriMo recommend a minimum daily calorie count to accompany your daily writing? Canned champagne? I’d say one calorie per word, so a minimum of 1,667 calories per day. A bottle of champagne has about 500 calories, so you’ll need at least three bottles a day. Add a little OJ, and you’re good to go! Sold! It will be like a legion of Hemingways. . .
Good luck, my friend! I shall be working the far less stressful side of the street at PiBoIdMo. I have done my time at NaNo, and now I’m out. I made the decision based on the fact I am getting ready to write the third draft to a novel I started this year. I really want to stay committed to this story rather than starting something new. I am going to feed off the positive energy of NaNo, however, because everywhere I turn writers are all about writing. That will help push me in my own writing venture. Good luck to you. I’ll be rooting you on! Thanks! It sounds like you’ve got your hands full. Too many projects at once spoils the broth, diluting the potency of each project. You’re right. There will be plenty of energy in the air in the writing community throughout November that should be free for the taking. You make it sound like so much fun that I just might have to do it! I did it a few years ago and I’m always tempted again around this time of year but then I fall back into revising my other novels instead. Still, I’d love to just write again instead of all that revising. Good luck! I’ll be cheering you on! Thanks, but I’d love some company! Put away those revisions for a month and take the plunge. Then go back to them “fresh” when November is over. Let me know and we can cheer each other on! I’m thinking of doing it but maybe just as a way of getting into writing short stories again instead of another novel. I could still try for 50K words even though that’s a lot of short stories! Make sure to load up on a lot of Halloween candy for that extra energy! Sounds like a plan! Think of it as a book of 10 (or more) short stories. I’ll be stealing my son’s candy for sure! Let me know if you register for NaNoWriMo, and I’ll check in to see how you’re doing. I guess I won’t be doing it this time around. I’m just too attached to revising my novel after all these years. I’ll be sure to cheer you on though! Get ready, get set….eat lots of chocolate! Let us know how it goes – we’re here to support you if you need it!